The Philadelphia Phillies have one of the youngest overall rosters in Major League Baseball. One of the more anonymous but successful of those youngsters this season has been relief pitcher Victor Arano. 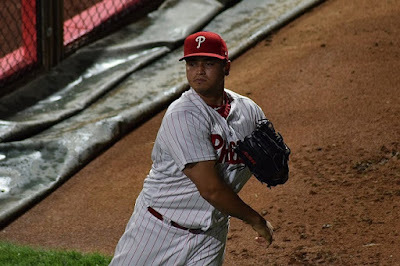 A 23-year-old right-hander originally signed with the Los Angeles Dodgers out of his native Mexico back in 2013, Arano was a starter when first acquired by the Phillies as the “player to be named later” in a 2014 deal for veteran reliever Roberto Hernandez. The Phillies converted the 6’2, 200-pound Arano to the bullpen full-time beginning in 2016. He would largely thrive in that role while rising through the minor league system over the next couple of years. Appearing on the verge of a big-league promotion, Arano was backed up some when a UCL sprain in his right elbow sent him to the DL at the outset of the 2017 campaign. He was able to avoid surgery, and finally received a first cup of coffee in Major League Baseball last September. Arano showed that he could get big-league hitters out during that 10-game audition, when he allowed just six hits over 10.2 innings with a 13/4 K:BB ratio. Arano came north with the Phillies from spring training back in March and fared well over another 10 games. But then a mild rotator cuff strain sent him back to the DL in late April. It would take him until May 20 to get back to the Phillies, and he hasn’t left since. During what is officially his rookie season, Arano has surrendered just 49 hits over 55 innings across 54 games. He has strong 2.45 ERA and 1.164 WHIP marks with a 70/19 K:BB ratio and three Saves. As Phillies management begins planning the makeup of what they hope will become a truly contending 2019 roster, Arano will certainly have a place on the pitching staff. Arano was reportedly unavailable earlier this week due to tenderness in the same right elbow that caused him to miss the start of last season. It was not believed to be serious, and sure enough the pitcher returned for a perfect inning on Thursday night. Arano is closing his rookie season with a flourish. Appearing in eight of the Phillies 18 games since August 25, he did not surrender an earned run in any of those outings. Not eligible for free agency until after the 2023 season, should Arano remain healthy he is likely to remain a valuable member of the Phillies bullpen for years to come. Originally published at Phillies Nation as "Victor Arano closing his strong rookie season on a hot streak"